My excuse, well, our excuse is that we couldn’t figure out where we wanted it. We debated building one on wheels that could sit in the middle of the patio when in use (and be pulled out of the way and stored at all other times), but with so much land around us it felt like we should just find a permanent spot for one instead of making an eternally-rolling-around sandbox. I guess we just couldn’t commit to a spot, so Project Sandbox went on an 11 month hiatus. 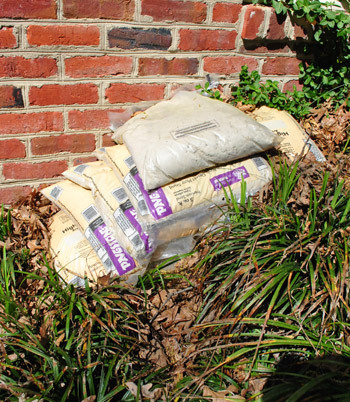 Although the play sand that we had already started stocking did come in handy when sandbagging our basement when Hurricane Irene swept through in August. 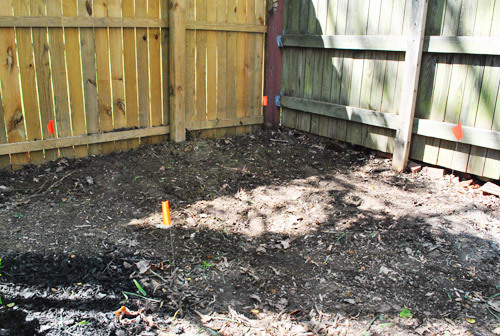 Though it mostly just sat in a sad pile in the backyard… a symbol of a broken promise. Picture a single tear sliding down my cheek as I say that. But our recent outdoor projects have given us renewed energy to actually get this baby done. More specifically, while tidying up the patio we uncovered the perfect sandbox spot. 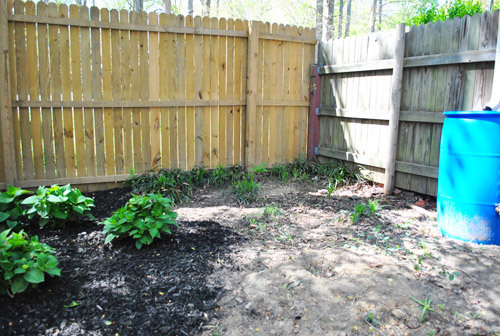 It had been hiding behind the now-deceased-and-therefore-removed rhododendron which made way for what is now a nice big open area that’s partially shaded by a pretty dogwood tree and adjacent to the patio. We instantly thought “hey, we could add a few stepping stones to lead Clara right to it from the patio, and it’ll be nice to have it placed within our small fenced-in side yard.” So we mulled it over for a little while longer and then decided that we weren’t getting any younger (nor was Clara) and this was THE place. Sold. It might look like a small cramped corner of the side garden, but it’s actually a nice level 7 x 7′ area – perfect for housing something functional and fun for the bean. Now we just had to figure out how we wanted to create this thing. I turned to Pinterest (yes, even I go to Pinterest sometimes even though I don’t have an account myself) for inspiration. There were lots of cute, ingenious, and creative incarnations of sandboxes – some very intricate, some pretty straightforward, all proof that there’s more than one way to skin this kitty. Here are some of our favorites: Dana Made It, Small & Friendly, Modern Parents Messy Kids, and Dover Projects. I knew I wanted something pretty uncomplicated. I’m great at making things harder on myself than necessary, so I was determined not to make a simple sandbox more intricate (or stressful) than it needed to be. But, you’ll see as I continue this post that I was only moderately successful at this. Anyways, the first step was clearing the area of – surprise! – liriope. Fortunately it wasn’t too thick here so it was a pretty quick task. 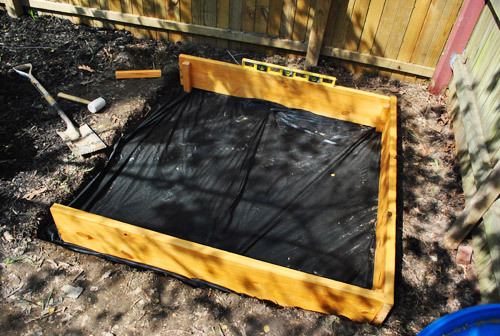 Based on the available space, we decided we wanted a roughly 5′ x 5′ sandbox. Not huge, but large enough that Clara and a friend/cousin or two could play without knocking heads. So I measured it out and used some orange flags that the previous owner left in the basement (they marked off our property line during closing) to mark my corners. 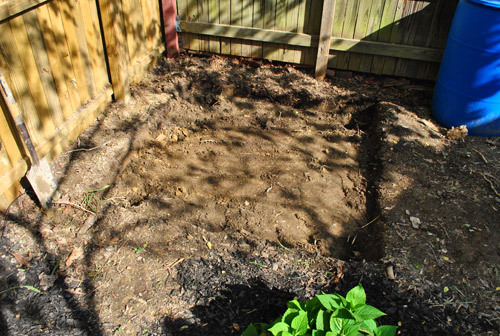 I then dug out the area about 6″ so that the sandbox could actually be sunk in the ground. I figured this would achieve a couple of things. For one, it would help keep the box in one place (and keep its shape). But more importantly, it would allow us to make a deep enough box to allow for some good sand-digging (Clara exhibits signs of becoming a future archeologist thanks to her extreme love of digging). Sure we could’ve just made a taller box – but we wanted the sides to be low enough that Clara could get in and out without any trouble. The hole wasn’t perfectly level throughout, but I did want to make sure all four sides were level so that my boards would sit square and even. Speaking of the boards, these are 2 x 10″ pieces of framing lumber (the same stuff we used for our office desktop). We didn’t get pressure treated wood since we learned that a lot of it is treated with chemicals that aren’t meant for children to be in regular contact with (more on that here). So we decided regular framing lumber that we could seal for outside use would do the trick. I bought two 10 ft pieces and had them cut into 5 ft lengths in the store (for about $17 total). We chose it because it’s thicker than your average board so I thought it’d be nice and sturdy – and maybe wide enough for a toddler’s bottom to sit on (we have both since perched our own bottoms on it and it’s not too bad, although we prefer to sit in a nearby patio chair that we just turn to face the box). We decided not to do any actual seats or overhangs for one singular reason. KILLER SPIDERS. I had distinct memories of those being incessantly creepy and spider-webby in the sandbox that I had growing up (picture thick webs with sinister eight-legged things lurking under every overhang). Plus we always just sat right inside of it and played, so they never got used. 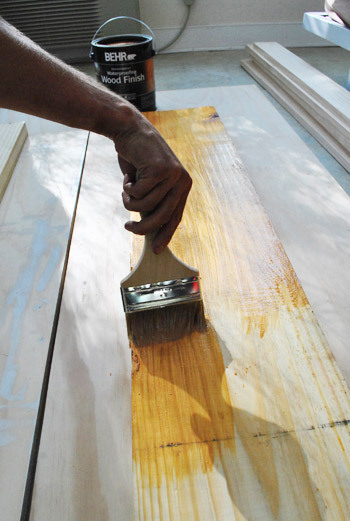 To seal and extend the life of our framing lumber we used some waterproof deck stain on it. We picked up some basic Behr stuff at Home Depot (for about $25). 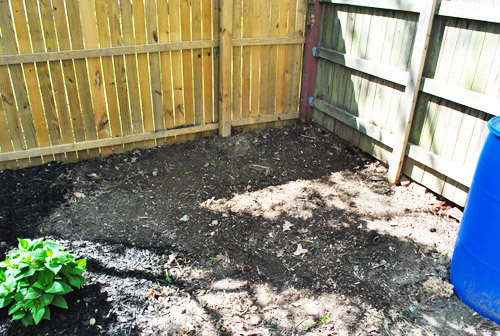 We chose the “Natural” stain after opting not to paint or otherwise add color to the sandbox. We were tempted to give it a cool pattern or color (we loved the striped example from Pinterest), but we figured that effort would be lost after the general wear and tear of being outside would make it dull and dirty (we intentionally buy wood, ORB, or black outdoor furniture/planters most of the time since after a rain the dirt speckles that pop up and are visible on painted items bum us out). Plus over time this finish will match the fence we added around the patio – so it’ll hopefully just be a neutral color that repeats itself around the garden so it fits right in. Here are the four sides all stained and drying (they’re a little orange here, but look more natural outside – especially after we spreaded some rich dark mulch around them a bit later). The four pieces in the back were some scrap framing lumber that I had from another project (our desk perhaps?) that I cut into short corner posts on my table saw. 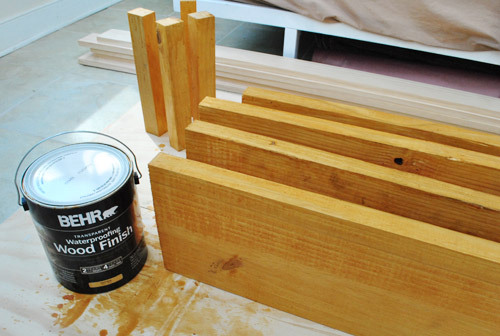 I did two coats of the stain on all sides of them as recommended on the can and let them dry over night. Then it was time to start assembling things so it no longer looked like I was digging a grave for a very skinny and very box-y creature. Before installing the boards, I put down some Weed Block as a base. 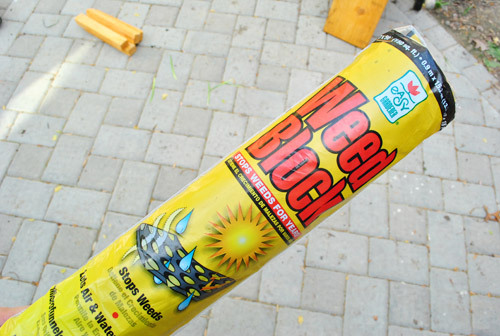 This would help block weeds (duh) while also creating a barrier between the sand and the dirt. 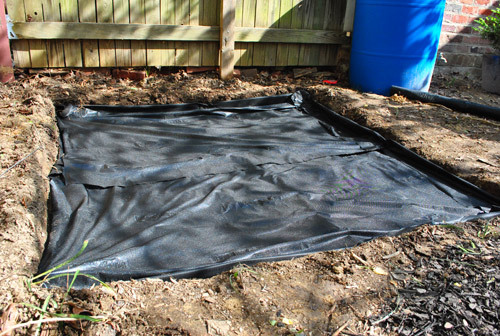 Although we made a sandbox cover, we wanted to be sure to use something that allowed air and especially moisture/water to pass through so that our sandbox didn’t get all clammy. In most cases, breathable = infinitely less nasty. I had lots of leftover Weed Block from an old mailbox project so I laid two layers (going opposite directions) to help minimize sand-to-dirt contact. I held it down in the corners with some garden staples. 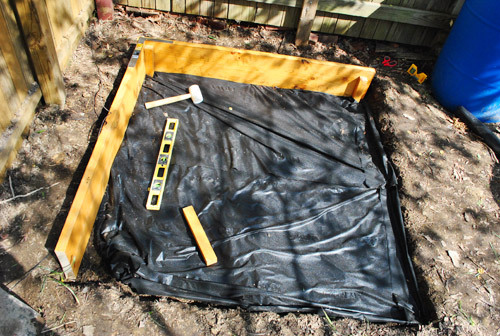 As far as construction, I ended up mimicking the design of Modern Kids Messy Parents‘ sandbox the most – thought instead of building my box and laying it into the hole, I built mine in place (I worried about being able to maneuver the already-constructed box as easily). The basic system here is that I dug a stake into each corner. They were only 4 or 5″ inches into the ground, so ultimately they didn’t provide that much stability (that instead came from the boards themselves). So mainly the stakes were just helpful in providing a common place for each board to be attached. After digging each stake in (and packing some dirt around it before recovering the area with Weed Block) I used a square ruler to make sure my corners were 90-degrees. Then I drilled in some 2.5″ exterior decking screws – one from the outside and one from the inside – to attach the board to the stake. It wasn’t the fastest system in the world, I’ll admit (since there was lots of triple checking level and square corners) but I slowly started to get what looked like a sand box. Minus the sand. Here’s the completed box. I was DYING to just dump sand into it and invite Clara out to play, but there was still more to do to make sure it was toddler-ready. Sigh. 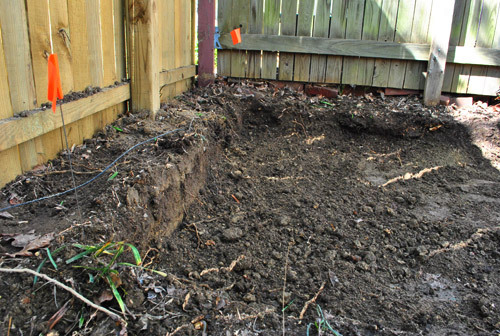 First I had to backfill the sides with dirt so that there wasn’t a moat around the edge. You’ll also note in this picture that I placed the board on top of the Weed Block fabric (see it peeking out there). That was to help it stay in place even better. …A COVER! 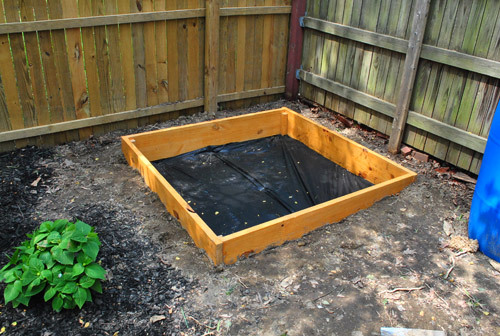 You know to keep neighborhood cats from thinking it’s a giant litter box. And to keep birds from dropping some presents if they’re flying by. But not just any cover. One with hardware that hinges open and can be secured so we don’t worry about Clara pulling it closed on herself. Yup, Sherry and I did some brainstorming, and we had some fun coming up with a cover that adds safety and function to the whole shebang. And since this post is already too long, I’m gonna put the details about making the cover in a second post for you this afternoon. Hence the title of The Sandbox Chronicles. It’s not quite Narnia, but it’s a heartwarming story of a girl and her toy trucks. You’re probably already getting a sense that I made it more complicated than it needed to be (you’d be right), but ultimately we’re really happy with how it all turned out. And since I feel bad about writing a whole post with no shots of the sandbox actually in use, how’s this for a sneak preview? Anyone have any sandbox stories / memories / projects to share with the group? I know I loved mine growing up, but Sherry didn’t have one so I wonder if they’re a regional thing. Have you taken 11 months to get something done that you thought was “just around the corner?” Let’s commiserate. Psst- We had fun weighing in on some open shelving pro/con chatter over here. 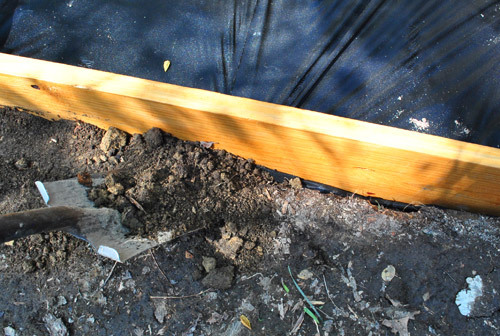 Pssssst- To read The Sandbox Chronicles in their entirety, here’s Part 2 (about building the lid which secures to the fence for safety reasons) and Part 3 (about swapping what we found out was “bad sand” for pea gravel). How sweet! Definitely get a cover, not just to keep cats out but to keep the sand dry. Oh yes the cover is already built and on there! Just broke this baby up into two posts since it got so long. Cover pics and info to come this afternoon! I’m so excited to see the end result! Our little guy adores his sandbox (my father in law constructed a massive one from concrete, complete with a tunnel out to the grass) but we haven’t got a cover, so are constantly on the lookout for neighbourhood cats who might like such a big “litter box”. So fun, can’t wait to see the results! My dad actually dug this huge sand pit and our jungle gym/swingset was placed in it (which made for a soft landing if we fell). It was HUGE, like a truck had to bring all the sand! So many good times in the ol’ sandpit. I hope Clara loves it. What a lucky girl! 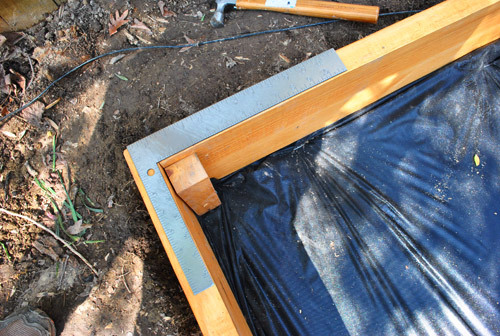 I had a plastic sandbox and loved it. I also had a wooden box like this that my dad built and then put in a (full size!) steering wheel and gear stick from an old car, complete with driver and passenger seats. We thought we were really cool. Oh my gosh that sounds like so much fun! Your dad rocks! Very nice. Your very VERY next project must be a lid. Must. Be. A. Lid. Quick, before the neighborhood cats find it. Don’t get me wrong. I love cats. I adore cats. I have 6. But they WILL find that sandbox and think you made it for them. Haha- it’s done! We mentioned we made it already and will be sharing those pics/process in this afternoon’s post! This post just got really long so we wanted to break it up! What kind of sand is that? It is exactly what I have been looking for but can only find the grainy kind. We’re in the pnw though, so maybe that softer sand doesn’t exist here? We got it from Home Depot (it actually says Play Sand on the bag). 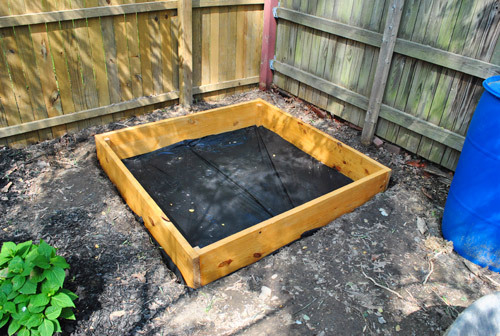 Growing up – I had an old fashioned wooden sandbox with NO LID – amazing I survied childhood without catching a disease. My kids had the plastic turtle sandbox with a big plastic lid that doubled as a sled in the winter. I’m sad they outgrew the sandbox but not sad about the sand they tracked in the house.all.summer.long. Enjoy your beautiful sandbox and can’t wait to see the lid! Exciting! I bet Clara is lovin’ it. Nice job. Luckily, the playground down the street has a giant sandbox (complete with play backhoes they can sit on and operate), so my girls will get their digging fix there. Oh sandbox………I love that the bags of sand usually say….50 pounds of pure fun!! Haha, that’s funny. I never noticed that! Glad to hear you decided to add a cover – I was thinking, I hope they thought to build one so when it rains the sand doesn’t get nasty and so the cats don’t pee in it. My sister had a sandbox as a kid and when she forgot to cover it that usually ended up happening and then my parents would have to clean it out and put in new sand (pricey!). I can’t wait to see what you guys decided on this afternoon. Haha, I always love a good sandbox cliffhanger, don’t you? Unfortunately I don’t have any fun sandbox stories. Never had a sandbox but my cousins and I did dig in the sand at my grandparents’ lake house a lot. Oh and this has nothing to do with this post, but just thought I’d mention that I’m actually flying to Dallas next weekend to meet The Bloggess (of Beyonce the chicken fame) and am EXTREMELY excited. I wrote about it on my blog yesterday. No way! I love her! She emailed me once and I almost died. Tell her I say hi. She’ll probably give you a blank look though. Hahaha. Have so much fun! I can’t WAIT to read your blog post about meeting the blogess! And Sherry you realize people feel the same way about you, John, Clara, and Burger, right? I jumped up and down like a little kid the first time you answered one of my comments and again when you twitted at me re a cute photo of Burger. Aw you’re sweet Kasey! But we’re definitely not big-time like the Blogess! Haha. Lauren….did you know they do immunotherapy for insect venum? Just saw you mentioned being allergic in your post. It works the same way that it does for pollen, etc. My son has a peanut allergy and we are doing a clinical trial for immunotherapy for that (food not shots though!) and I have just learned so much about it all! I think a lot of people aren’t aware that immunotherapy exists for anything other than pollen….they can do it for stings, cat, ant bites, etc. anyway, not home improvement related, but always looking to save lives from allergies! ;). And Lisa, I have actually looked into it since my sister-in-law is currently receiving immunotheraphy treatment for her dog allergy, but the doctors are not sure if it would work for me since my allergy developed from an overdose of the toxin and was not something I was born with. And it seems like a lot of shots for something that MIGHT work. Haha, I love the post titles. Looking forward to those! Also impressed that you will be blogging from jail! This is stinkin’ cute! I know she loves it! It’s actually nostalgic for me too! My dad built me a sandbox and playground set when I was little and I actually got to help him plan it and design it when I was like 4 or 5. I loved it! I guess maybe that’s a small part of why I love DIY so much! 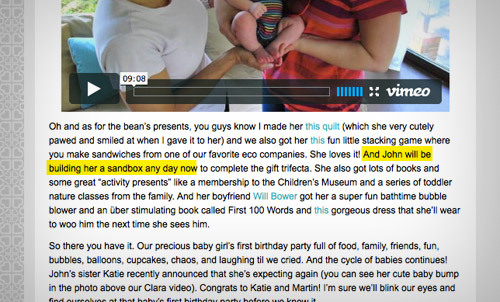 Oh and I submitted too quick but seriously, Clara is one lucky girl to have such awesome parents! Aw man, so I was just missing out as a kid then? The funny thing is that I don’t remember playgrounds having sandboxes either. We played with sand at the beach (at the Jersey Shore – haha) and that was it! That’s so funny! Here in VA most parks have a sandbox and I wonder if that’s a new thing or if they always had them down here at public playgrounds! I (like a lot of kids I think) had the classic green turtle sandbox. 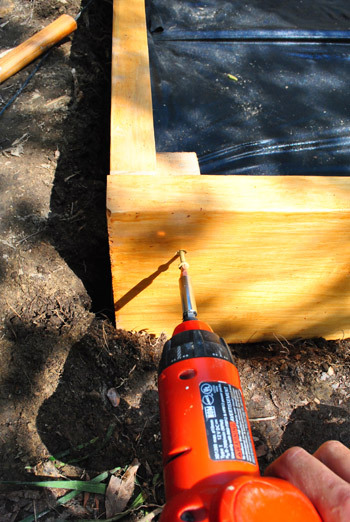 Think big, green, circular, plastic sandbox with the shell as a lid. I enjoyed it but not for too many years. Got gross and then unused. looks great! can’t wait to see the entire reveal and clara’s happy little face! Haha, aw thanks Silke! It’s so funny how we finally get things done and in hindsight we have no excuse for putting them off that long, except that life happens and things just get put on the backburner. Happens every time! Haha. My sandbox as a child had a ladder to a deck build above it. Then that was framed in and had a slide down from the top. Lots of fun. Maybe something you can add in the future when the Bean is ready for a little backyard playground of her own. I have fond memories of my childhood sandbox. Would play in there for endless hours. I posted a blurb about it here. We definitely had a sandbox as a kid and it was awesome! My parents got rid if it though the day we dug up cat crap. Or maybe once they realized there was no way to keep it clean because the top kept coming off. Or something. All I know is we had it, and then we didn’t. Maybe it broke (it wasn’t wood). Hahaha. While we did have it though – super fun town! Wow- that is amazing. That story needed to be told. And oh my gosh- your hubby is my hero! I would bake him an apple pie but I’m not sure how the scent would go over… and also I can’t bake an apple pie. Haha he can handle apple baked goods. Just not fake scented apple stuff like candles/spray/etc – and oddly it’s a very specific fake apple scent too. Like the fall apple spice scent. hahaha I know, I’m with you. When in doubt, laugh. We had a swingset/sandbox pit growing up, so it couldn’t be covered up. But, I don’t remember many spiders or cat or bird poop. I just remember building forts and construction sites that I drove my matchbox cars all over. Great memories!!! I love it! We actually went and bought lumber last weekend, because our little Madisen (2.5 yr old) gets her sandbox this weekend (after being really good and going to bed when she is suppose to this week.) Oh, and we are going to be putting seats on the corners because our daughter wants to put spiders in her sandbox (hopefully no killer ones!) She is so excited, thanks for the post! My parents built us an awesome fort when I was a kid. Two stories, and the first story was a giant sandbox. It was completely shaded by the floor above, and completely awesome. I played in it all the time. My poor Barbies got very, very dirty. We had a sandbox at our cabin and it was amazing. It wasn’t too large but we could fit about 8-10 cousins in there. We used it for years, even as teenagers. I remember one day we all spent hours building this elaborate castle and decorated it with the little plastic army men. We also buried those firecrackers that are all linked together into the castle. After everything was built we lit the fuse and it was glorious. I hope Clara loves her sandbox! I’m building one for my son this summer so I’ll be back for notes! That’s amazing! I love the army men story and the fact that you used it even when you were older. Love it love it love it. I loved him and remember every time a hurricane threatened I’d always ask my mom to duct tape his lid shut so I wouldn’t lose all my sand! The joys of Hampton Roads! I grew up in New England and my engineer father built my sisters and me a sandbox right outside the back door: you could jump from the porch railing right into it (not that I ever did that…). We loved it. The sides were cement blocks covered by red wood planks (we did sit on them to play in the sand) and no cover – and back then there were many cats roaming around, and I never recall one using our sand box. It stayed there until after all three of us had graduated from college, and then suddenly the porch was redone with steps down the side and the sandbox was gone! This is such a cool sandbox. Clara is going to have so much fun! I had a green plastic turtle sandbox growing up. It is now burried in my parents backyard. I remember my daycare had a huge one though. It was wooden and has a canopy overhead. I am pretty sure it had a place for te spiders to hang out though. 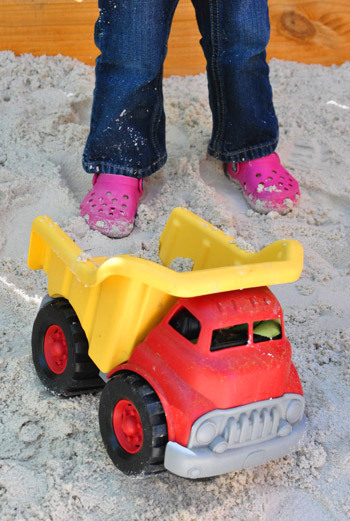 I grew up with a sandbox–it was an old tractor tire filled with sand! I remember the tire would get HOT in the summer but I still played in it quite a bit. Can’t wait to see the final photos! Hey, I was going to say I had an old, HUGE tractor tire for a sand box for a few years (it was in Scotland, on a farm, hence the tire). Thought I was the only one, nice to see I wasn’t! My husband built a 4’x4′ sandbox last year for the kiddos, and I cannot even begin to describe how much time they have spent in it. Best. play. thing. ever. Perfect for imagination, creativity, etc. We don’t have a cover on ours, but with Mocha (our fireball dog) in the backyard, we’ve never had problems with cats, and rain is great – you can only build with wet sand, not dry; the top dries pretty quickly, then you have lots of good wet sand underneath! Haha, I love that Mocha guards it! This is looking great – eagerly anticipating the finished project. My father built me and my brothers an awesome sandbox when I was little. I loved it. Clara will love yours, too. I did want to comment that I love your reason for nixing the seats. Good idea! The sandbox looks great so far! What a simple idea (made a bit more complicated in true John fashion, heehee), I think I can get my hubby to do that….when he’s done with the list of a million other projects I have for him right now:) can’t wait until this afternoons post for the cover details. This makes me so nostalgic for the sandbox I had when I was little! Once I got a little bit older I had the crazy idea to try planting watermelon seeds in mine. I got some cool looking plants, but never a watermelon. Haha, that’s amazing! What a sweet discovery! Not a regional thing- I had a sandbox in North Jersey! Woot! A Jersey sandbox! The first I’ve heard. You were a lucky girl! Looks great! We had a sandbox in CA, one in GA and one in MI so nope – not regional. My dad built the one in GA and MI but we had a plastic store-bought one in CA. We never had lids and never had any issues with cats/birds/the like so I guess we were lucky. So interesting! What about public playgrounds? In Jersey I had never seen one in a playground but here in VA they’re almost always there. Wonder if it’s just a newer thing. In Jersey we just played with sand at the beach and no one I knew had a sandbox! I loved my sandbox. Mine was wooden too but my dad avoided overhangs by just boxing in little corner seats. So there were no 90 degree angles..if that makes sense. They weren’t big seats but as I got older, at the ripe old age of 5 and a connoisseur of fine sandboxing, I appreciated being able to avoid sand up my shorts. Ha. She will use that thing for a long time. So exciting. Ooh that’s smart to box them in! Oh how cute…..I can’t wait to see the cover for it ~ and more pics of Clara playing in it. No way!! How can she almost be 2…..seems like yesterday you had her 1st bday party!! OK, this is too awesome! I’m going to have to convince my husband to built a sandbox in our backyard!! This is perfect timing as we were talking about sandboxes last week. I was telling my friends how when I was growing up, we had our sandbox in an old tractor tire (growing up on farm land in Indiana), and I thoguht that was the cool thing, like everyone was doing it. It wasn’t until last week as I was telling that story that I realized that I was the only one who had my sand inside of an old giant tractor tire. My parents were so practical and doing the ‘use what you have’ before it was cool. Haha, I love it! We have heard from a few other tire folks! So smart! Nice sandbox! I wish we had room for something like this, but we just don’t have the room in our small and steep townhouse backyard. :( Sidenote…is that the green toys dump truck? I was just looking to buy this for our soon-to-be-1-year-old-in-May. Does Clara love it? Oh yes, she loves it! It used to be an inside toy and she’d put her little dolls and animals in it, but now she loves it outside to put leaves and sticks – and sand – into the back. I totally remember the spiders! Sandboxes kind of freak me out for this reason. We have a small back patio (separate from the backyard which is fenced because we have a pool) and so I bought one of those plastic shaped-like-a-turtle ones. The boys LOVE it, but oh man–sand EVERYWHERE. And because it’s right outside our back door (again–pool), it means we have sand in our house all the time. I think you guys should be fine as yours is a few extra feet away and so most of the sand will naturally escape before Clara hits the back door. Keep a broom handy just in case. Also: expect that she might try to help the plants with sand. I keep finding sand in my basil. Haha, that’s so funny about the sandy basil! I love this sand box! We want to build one for our 17 month old, however we are having trouble finding play sand. The play sand at our local Lowes says it contains silica (and after a little research also probably asbestos tremolite). I am having trouble locating some play sand without this. Were you able to find any? I poked around online and found that I should be looking for River or Beach Sand. Short of driving to the beach with a bucket, I’m at a loss on where to find this sand locally. Oh yes, boy do we have a story for you. Stay tuned for the next two sandbox chronicles. Haha. We did find a good solution though! Never heard of that! Thanks for the tip! My husband is building a sandbox for our son too! It is in the garage drying and should be finished in the next few days. Can’t wait to see your finished product! Good luck with yours too Kelly! my parents built us a sandbox in the back yard, we had one at both houses we lived at. best sandbox story – my mama seeing a weird light/heard noises in the yard at 2am and going out to see it was my 8 year old brother out with a flash light just chillin’, playing in the sandbox!! he loved that thing…. Haha, we do love the idea of her not getting burned while playing! Thankfully the whole side lot is under the shade of a few trees, so it’s not very sunny! A little awning could be cute someday though- just for fun! When we moved into the house my parents still own, there was a rather sad-looking sandbox in the back. My dad renovated it into the coolest sandbox in the neighborhood, and that’s not even hyperbole. 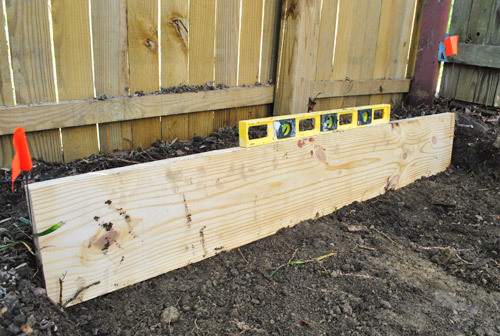 He used wood that looked kind of like a balance beam to create a tiered corners, leaving a low opening on each side in the middle. I believe we had two corner seats opposite each other and two open corners. And while the construction was nice, it was the sand that really made it. My dad is a civil engineer, and at one of his job sites they had ORANGE sand. So we drove our van there and filled up 5-gallon buckets and we ended up with a sandbox full of golden-orange sand. My mom despised the way our socks tended to turn orange, but everyone thought we were so cool. I’m pretty sure the bottom was plywood, because I can remember digging tunnels until we couldn’t dig anymore. Haha- that’s so much fun! Oh, and I grew up WI. Just about every public park I remember going to had a huge sand area, and the best was then they had digging machines that you could sit on and control the scoopers. Kind of like a manual, kid-friendly backhoe. Oh man. I remember the killer spiders lurking under the seats on our sandbox. We never used the seats anyway. Why sit on a board when your bum could be firmly planted in the sand? Very curious about your cover!! We customized our swing set to include a sand box under the fort. BUT, we now learned that we need to make some more ventilation holes because the sand got moldy over the winter. YUCK! Update coming soon!! Yuck- thanks for the warning! Very smart customization! 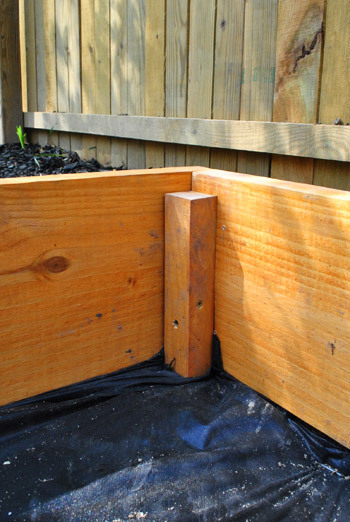 would love to know if anyone else knows how to cure it – air holes is one and I think we need some drainage holes in the corners so that the water has somewhere to go when it gets in (inevitable with decking material on top).